Bots are now tackling tricky and dangerous jobs to help the environment, from clearing invasive species to fighting wildfires. Robots can do all sorts of things, from performing delicate surgery to collecting mineral samples on Mars. Now a new generation of robots is lending a hand at protecting our environment by taking on tasks that are too difficult or too dangerous for humans. “There are a number of examples where robots are becoming the hero in terms of doing things that humans can’t,” says Matthew Lloyd, chief marketing officer of Robots in the Service of the Environment, a Boston-based non-profit that builds robots to do environmental work. Coral reefs around the world are under threat, not just by rising ocean temperatures but also by invasive species. So roboticists Down Under have devised a torpedo-shaped bot that can stalk and kill the Crown of Thorns Starfish, which in recent years has been decimating the Great Barrier Reef. Dubbed RangerBot, the three-foot-long device uses cameras and acoustic sensors to identify the starfish and then inject them with deadly poison. And when it’s not snuffing out pesky starfish, RangerBot can monitor reef bleaching and identify the species of fish living on the reef — tasks that used to require humans. The RangerBot is being tested right now, with plans to roll out up to 50 bots in 2018 to work in Australia's Moreton Bay in Brisbane as well as the Great Barrier Reef. Dunbabin says the team has carefully designed the robot to minimize any risk to humans in the water. It operates only at certain depths and has an obstacle avoidance system that keeps it from getting too close to humans. The best way to clean up an oil spill is to keep it from happening in the first place. To do that, oil companies carefully inspect their pipelines. They’ve long relied on "pigs," barrel-shaped devices with brushes or sensors that go through pipelines like giant pipe cleaners. But pigs are too big to be used to inspect small-bore pipelines, so Russian engineering firm Diakont has developed a pipe-inspecting robot called RODIS. The device looks a bit like the lovable bot from the 2008 Pixar movie “Wall-E”. As it moves along inside a pipe, it uses sonar to test the structural integrity of the pipe walls while its arms trace their circumference, looking for cracks or other flaws. RODIS works slowly, covering only about a quarter-mile of pipe per day. But it's designed not to miss anything. Humans who help clean up waste at decommissioned or damaged nuclear facilities must take extreme precautions to limit their exposure to radiation — like dressing in special suits and carrying sensitive radiation monitors. Even then, they must carefully limit how much time they spend in the hot zone. 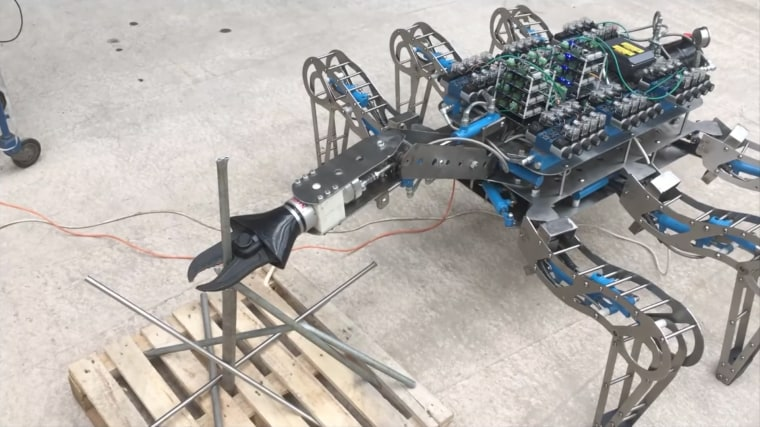 But Latro, a proof-of-concept robot created by Forth Engineering of Cumbria, England and the University of Manchester, has no such limitations. About the size of a kitchen table, the spider-like robot has six legs that enable it to climb over obstacles and collect radioactive material — and a computer brain that lets it make some decisions while being remotely operated by a human. Other robots have trouble operating in cluttered and submersed environments, says Farshad Arvin, a University of Manchester roboticist who helped develop the bot. “It's developed for a specific application which needs a powerful robot and flexible control,” he says. Latro was designed specifically to help clean Sellafield, a contaminated nuclear storage site in Seascale, England that contains some of the world’s most contaminated buildings. But the bot could soon be helping clean up other nuclear hotspots or working to inspect oil tanks. As the climate warms, wildfires have become increasingly common. The conflagrations can be as dangerous to humans as they are destructive to the landscape. But a new radio-controlled quadrotor drone called Indago uses infrared sensors to pinpoint the exact location of a fire and then works in tandem with airborne tankers to make sure water gets dropped precisely where it’s needed to extinguish the blaze. Created by Lockheed Martin, Indago streams live video to the operators on the ground, who use the data to identify the fire's location and intensity and to pinpoint people and property at risk. The drones are already working in Australia and may see action in the U.S. and elsewhere this summer. Luigi is a robot with a dirty job most humans are happy to give up: collecting waste from sewers. Designed by MIT’s Senseable City Lab, the cylindrical robot descends into a manhole, stopping a foot or so above the waterline to take samples. The samples — which contain information about pollutants, infectious diseases, and drug use in the community — can then alert public health officials to potential health problems. Luigi is now remotely operated, but future versions will be autonomous. It can decontaminate itself and analyze pathogens on the spot.